If you’re seeking accessibility web design to ensure your site meets the standards of the people who will be using it, we can help. We put a fundamental focus on accessible web design, including using development tools that aid physically disabled persons and those with vision and hearing impairments. We’ll make sure your website is welcoming and easy-to-use for everyone visiting it, no matter their accessibility requirements. Text supplementsfor images, graphics, buttons and other visuals. Labels for form controls, including input prompts.tools for changing content presentation to accommodate disability. Text transcriptsfor audio and video content. Description fornon-text content, includingaudio and video content. American Sign Language (ASL) interpretations. Voice-activated prompts, such as searching or magnification. Mouse functionality available via keyboard. Content is responsive to accommodate assistive devices.Accessibility and development accommodations go even beyond these basic principles to address a wide range of concerns by users who may be limited in their browsing by conventional website design. Further examples include providing monochromatic color options for colorblind users or low-intensity visuals for those with seizure concerns. Ultimately, accessible web developmentis all about considering every possible avenue when it comes to making your website convenient and easy-to-use—regardless of the person visiting it. Web accessibility has been mandated in the United States since 1999, when the Web Accessibility Initiative project was started by the World Wide Web Consortium (W3C). The purpose of the project was to develop and implement a set of accessibility rules and standards, to accommodate the millions of people browsing online who requireaccessibility web design. From this, the Web Content Accessibility Guidelines(WCAG) were born. In 2008, they were subsequently updated to accommodate new technologies and expand the accessibility guidelines further—this led to WCAG 2.0, which serves as the foundation for modern accessible web developmenttoday. This, in conjunction with ISO/IEC 40500:2012—international standards for accessible web development—are what today’s web developers rely on to create a robust browsing experience for all users. Today, accessible web design falls under Amendment 508 of the Rehabilitation Act of 1973, which mandates that all electronic and information technology provided by agencies of the Federal Government must be accessible to those with disabilities. It prevents discrimination of individuals with disabilities from receiving information via computers, websites and other electronic mediums. Amendment 508 references government entities specifically, however it’s complemented by Title III ofthe Americans with Disabilities Act (ADA). This piece of legislation expands discrimination protections to all citizens, mandating that affirmative steps are being taken to ensure equal accessibility to websites and other digital media by disabled persons. Together, Amendment 508 of the Rehabilitation Act and Title III of the ADA serve to offer individuals with disabilities due course of action when it comes to making sure digital information remains accessible and available to them.Is WCAG2.0 a legal requirement?Though not legally mandated in its entirety, the United States Justice Department touts WCAG 2.0 as a standard for appropriate action when it comes to accessible web development. Website providers who do not meet WCAG 2.0 standards are not noncompliant, however they may face criticisms from organizations and groups and even legal action if a website doesn’t meet a threshold for accessibility that upholds Title III of the ADA.Through not a staunch legal requirement, WCAG 2.0 provides the framework for what is acceptable for accessibility web design. Following this comprehensive set of guidelines ensures that developers are paying close attention to the many facets of accessibility and that the needs of all disabled persons are being met. Informational:The essence of providinginformation is to educate visitors to your site.If your site has accessibility barriers, you won’t be able to convey information to those who may be looking for it! 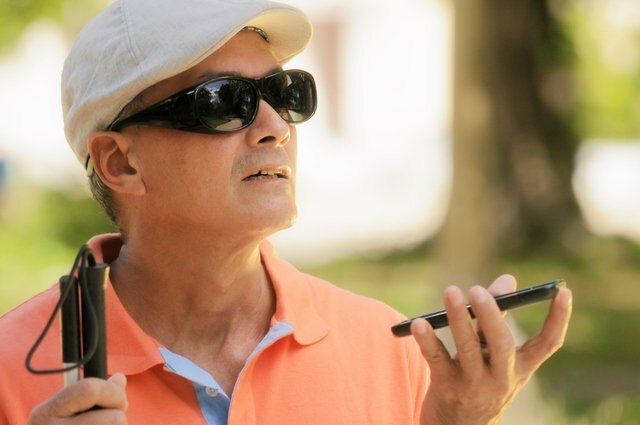 Having text-to-speech, captions and more can help make sure visitors are able to get the information they’re seeking, regardless of any impairments. eCommerce:If a shopper comes to your ecommerce site ready to spend money, the last thing you want to do is turn them away! Now, imagine turning away an entire population of visitors because youronline store doesn’t offer the accessibility they need to make a purchase.Make sure your site offers accessibility features if you want to close a sale. Service-based: Service-based websites need accessibility features in the same way a brick and mortar storefront might. Instead of wheelchair ramps and braille signage, however, your site needs alternative browsing features that enable disabled visitors to get the help they need, just as they would in-person. Educational:Everyone is entitled to getting the best education they possibly can. An educational website without forethought to accessible web developmenthinders those with disabilities from being able to learn. Your education website needs accessibility features implemented to guarantee the same quality educational experience for all. Entertainment:Entertainment shouldn’t just be reserved for those free from accessibility issues. Having accommodations on your site for those with impairment enables these visitors to enjoy multimedia experience in their own unique way, exposing them to the same joy and satisfaction as anyone else.Every type of website requires a broad range of accessibility features, yet each site also demands specific accessibility applications. Tailoring accessible features to the site opens the door to possibilities for every visitor. Count on us to ensure your accessible web developmentis perfectly tailored around the form and function of your site, so it’s able to provide a seamless, high-level experience for every visitor. The importance of accessibility web design Roughly 20% of peoplein the United States sufferfrom a disability, with half of this group citing debilitating impairments that leave them seeking alternative forms of accessibility. It’s important for websites to recognize this substantial portion of the population and make sure they’re opening their sites to a seamless, accommodating browsing experience. Accessible web developmenthas important benefits for both site owners and the people browsing. navigate online and have experiences and interactions that enable them to enjoy the web to its fullest. The bottom line is that web accessibility keeps the internet open and welcoming to all people, regardless of disability. This maintains a certain level of universality that welcomes all and gives everyone the possibility and potential to enjoy the most innovative technological tool ever created.Get Accessible Web Development Does your website live up to the standards and qualifications set down by WCAG 2.0? Can disabled persons adequately access, navigate and interact with your website, regardless of their impairment or assistive technologies?If not, it’s crucial that you think about seeking out accessibility web designright away, to improve the efficacy of your site. Or, if you’re building a brand-new website, be sure to factor in critical accessibility features before you take it live. Accessibility for allIf you need accessible web development—no matter the capacity—trust us to assist you.Accessibility is at the center of our complete approach to web design and development, and our focus is evident in both UI and UX aspects of the final product. Whether you’re developing a robust ecommerce store, reinventing your information database or building an entirely new entertainment platform, we provide the accessible features to keep it open and accessible to persons with disabilities.Adherence to WCAG 2.0 guidelinesFollowing WCAG 2.0 guidelines and testing our designs extensively against some of the most important accessibility standards, we make sure your site is integrated with everything it needs to serve disabled users. We also take the time to identify barriers that may exist in the design scheme of your unique website and create workarounds for them that accommodate users with accessibility needs. Our end goal is to provide a user experience that’s exceptional for anyone with alternative browsing requirements. And, we do it all within WCAG 2.0 guidelines.Never compromising on contentThe spirit of accessibility web designmeans delivering high-quality content withoutscaling it back for users with alternative browsing demands. Our approach to accessibility isn’tabout repealing features and replacing them simpler versions—it’s about finding viable alternatives that make the most of these high-end features for impaired users. Through this focus we raise the expectation for your entire website, no matter the type of web browsing experience on the part of the user.Design your ideal, accessible websiteAre you ready to reap the benefits of a website that’s designed with accessibility standards in mind? Let our team provide the complete oversight you need, to make sure every individual has the best possible browsing experience. We provide accessible web developmentfrom start to finish, ensuring your site has the tools to be successful.